There has never been a high-end Slave Leia figure made in 1/6 scale (I’m not counting the Hasbro version, which is basically a Barbie doll, or the Kotobukiya version, which is a vinyl statue and also undersized for 1/6 scale). This is almost certainly because highly articulated figure bodies look terrible in skimpy outfits like this. Still, figure bodies are getting better all the time, and some even have rubber “skin” that hides their joints, so I expect that it’s only a matter of time before a good Slave Leia is made. But until then, a lot of people have been searching for alternatives. Gentle Giant’s Slave Leia statue is considered by many to be the best sculpture of Carrie Fisher as Slave Leia, and it’s in 1/6 scale, which means that it would theoretically fit in with Sideshow’s line of figures. 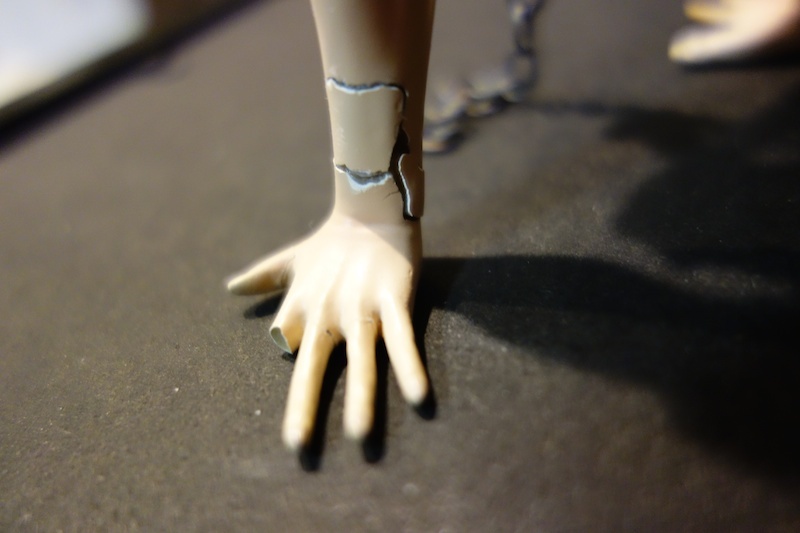 Her left hand was broken off, and unfortunately it had splintered rather than breaking cleanly. Three fingers and the thumb were also broken off (and one of the fingers was missing completely). Also, the cloth hanging from her waist was broken off. The seller was nice about it and gave me a partial refund, making the final price very reasonable, and this made the repairs I had to do a little more palatable. I started by super-gluing the cloth and arm/finger fragments back in place, but there were still obvious cracks, and of course there was the little matter of a missing finger as well. So I used some epoxy putty to smooth over the cracks and sculpt a new finger. I also sculpted a new section of cloth, because the piece I had was broken off on a straight edge, which looked very odd. Here’s the hand after repainting. It’s not perfect, but I think it’s certainly acceptable — especially since it’s tucked around the back of the figure anyway. I just wanted to make sure it didn’t stand out too much. The hardest part was matching the paint color that Gentle Giant used for the skin — especially since I discovered that many of my paints had dried out since I used them last. I got somewhat close after some trial and error. The color of the cloth turned out to be much easier to match. This is what it looked like on the bottom, by the way. You can see how it has literally been scraped away from the base. And here she is with my repainted Sideshow Jabba the Hutt figure. Absolutely gorgeous!!! Slowly working up to a similar display, some really nice inspiration there, too! I think Leia looks perfect – I don’t think I would dare remove her from the base but she looks so perfect there I might just have to try.